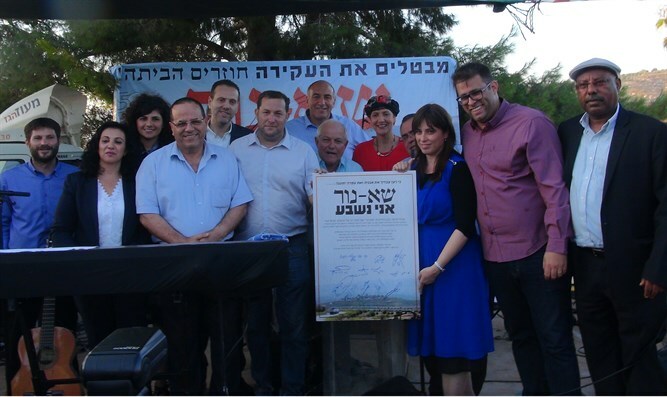 Some 2,000 people attended the rally on the ruins of the town of Sa-Nur in northern Samaria Thursday. The demonstrators called for the reconstruction of the Jewish town, destroyed during the 2005 disengagement. 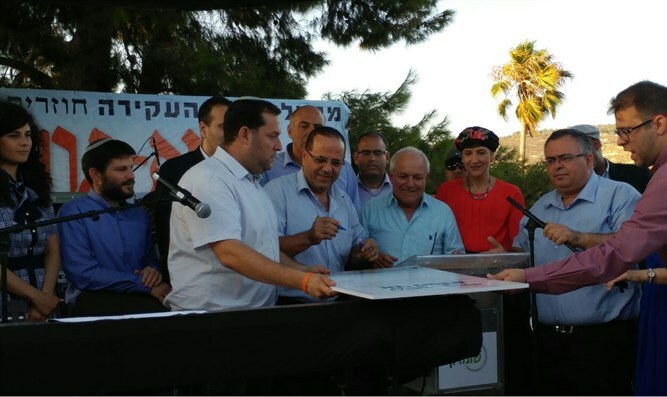 The rally was attended by MKs and ministers from the Likud and Jewish Home political parties, who expressed their support for a proposed bill to cancel the disengagement law, which was submitted by coalition chairman MK David Bitan and Jewish Home party chairperson MK Shuli Moalem Refaeli. Sarah Har-Melech, the 14-year-old daughter of Shuli Har Melech, who was murdered in a shooting attack in 2003, addressed Prime Minister Binyamin Netanyahu at the rally. I was born on the day my father was murdered on his way to our home in Homesh. We went through this horrible attack and returned to our home without a father." "But then, instead of strengthening our stand against those terrorists who came to break us, the Israeli government chose to expel us from our homes - to the cheers of the Arabs who waited for the moment when our spirit would fall," said Har-Melech. "What is the matter with you, Mr. Prime Minister?" she demanded. "I know that you have been presented with a bill to annul the Disengagement Law. This bill gives us hope." "Your government is with you. The whole nation with you. Har-Melech told Netanyahu: "Your government is with you. The whole nation with you. The roads here, the streets where we played - it is all waiting for you. My father ordered us to continue the construction of Homesh, which was much more than a home for him - and also the rest of northern Samaria. Please help us go home." Deputy Foreign Minister Tzipi Hotovely (Likud) said at the rally that "the Israeli government must redress the terrible injustice that was committed here 12 years ago ... There is only one way to correct this injustice - to build and establish settlements in northern Samaria, to return to our roots." "We have to rectify the injustices committed by nationalist governments because there is no nationalist government if it does not settle the Land of Israel. We will settle this place and lay the cornerstone of the construction of the settlement of Sa-Nur." Samaria Regional Council head Yossi Dagan, who was himself expelled from Sa-Nur in 2005, said: "We came here today, 12 years after we were expelled from our homes, to cry out to our government, which is the most nationalist government in the State of Israeli: do not stand idly by." "I call on the prime minister - do not give up this historic opportunity to rectify this injustice. Pass the bill to cancel the disengagement law and to restore our rights," Dagan added.